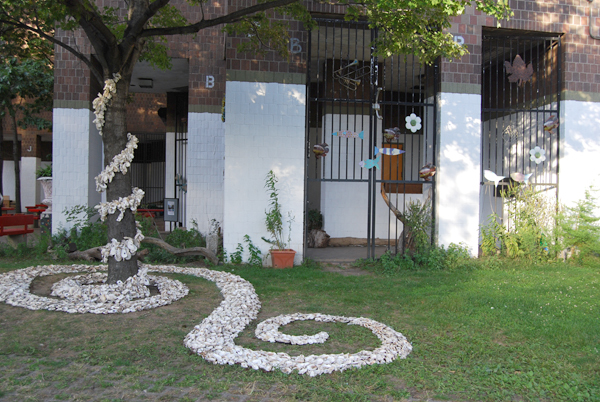 A traveling work of public art and an ode to New York’s environmental history, Meandering Midden (2009) was installed in three different places in 2009. 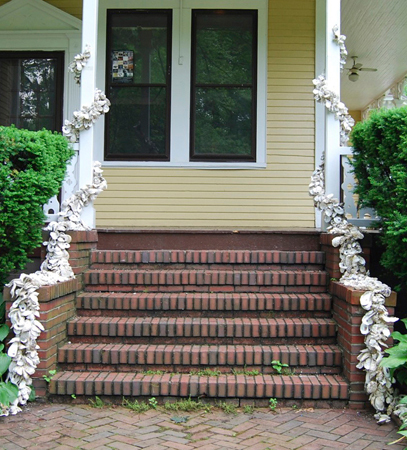 Oyster middens–piles of discarded shell–once littered the landscape of Manhattan and its neighboring shores, a testament to the astonishing abundance of the indigenous Eastern Oyster, Crassotrea Virginica. 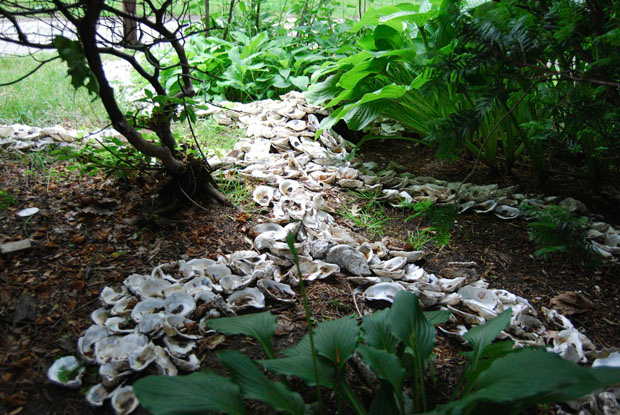 The Meandering oyster Midden installation was unique each time it was installed in that the sculpture’s shells take on the shape of the architecture and natural setting into which they are integrated. 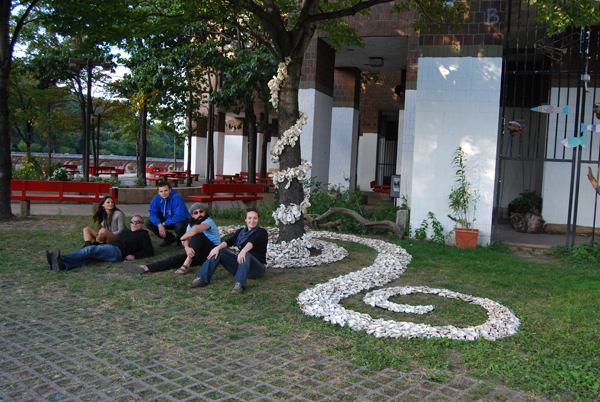 Oyster shells, the refuse of modern new York’s arduous appetite for oysters”, were collected by artist along with students and collaborators from The Oyster Bar at Grand Central Station. The work is a piece of Modern Archeology instead of eating solely the Crassostrea Virginica oysters from coast to coast including oysters from imported European fry are served daily. The Midden is litreally an ode to New York’s flourishing global economy where the oysters served here are from every corner of the world. 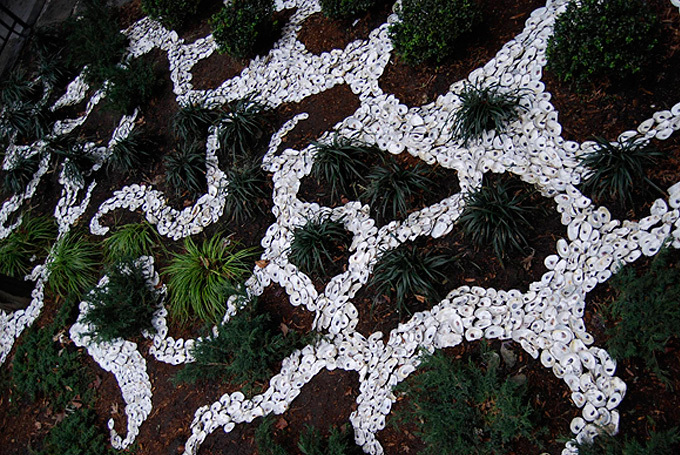 Oyster shell composed of calcium carbonate or lime and frequently used to “sweeten” acid soil by gardeners. 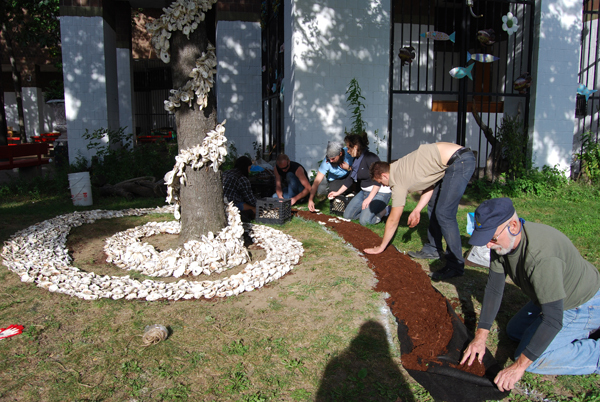 So as the installation naturally degrades and the shells get crushed into the urban soil it has the added bonus balancing the soil’s Ph.